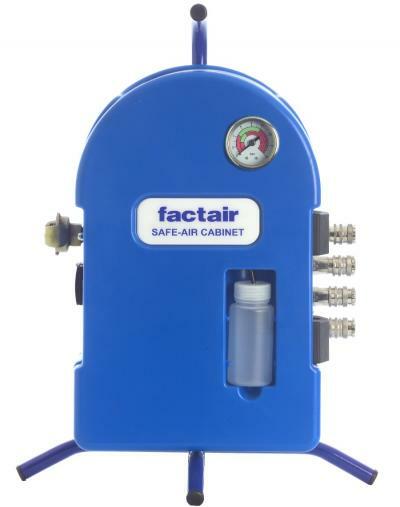 Designed to be connected to standard factory airlines Factair's range of Safe Air Cabinets and Trolleys provide high quality breathable air to BS EN 12021:2014 by filtration from a normal compressed air supply. In addition the Safe-Air Trolleys incorporate carbon monoxide and carbon dioxide reduction systems. Each unit is fitted to a pressure regulator, pressure gauge and automatic condensate drain. The breathing-air outlet pressure is set using an adjusting key and the pressure gauge incorporates the correct operating parameters for both positive pressure and constant flow masks, in accordance with the requirements of BS EN 14594. Mounted in durable, impact resistant polyethylene housings Safe-Air Cabinets and Trolleys can be used in the most hazardous and hard working environments. The Safe-Air Cabinets can be supplied in 2 different output sizes either 707 l/min from up to 3 outlets or 990 l/min from up to 5 outlets. As standard the Safe-Air Cabinets are provided with a coalescing and carbon filter; however, for heavier duty applications a pre-filter is also available. Units are available in either wall mounted or portable free standing configurations. 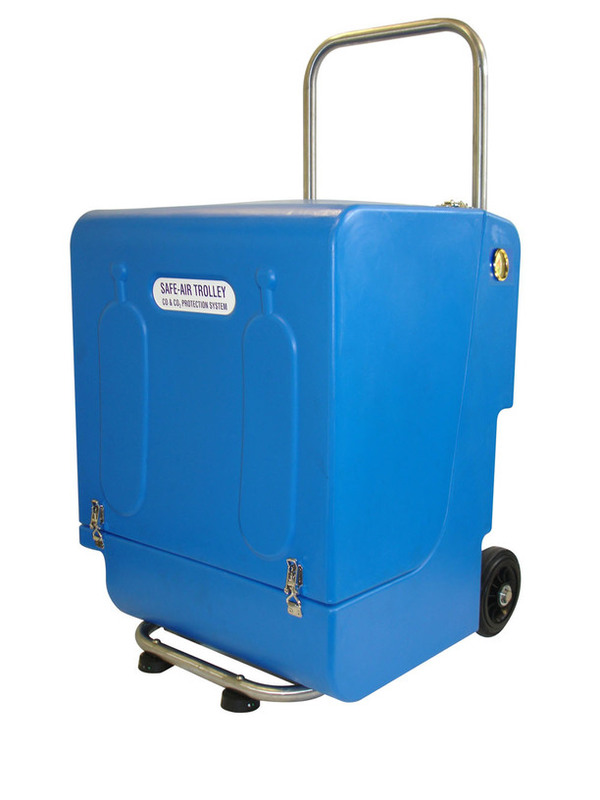 The Safe-Air Trolleys, which incorporate CO and CO2 reduction systems as standard. There are two options available; the SAT450HD which has two outlets and an output of 450l/min and the SAT950HD which as four outlets and an output of 950l/min. Also available is the F2257, this unit incorporates a breathing air filtration system with integrated alarm and failsafe backup from 2no 9 litre cylinders.